The IMF’s eurozone prediction has improved thanks to lower oil prices, a weaker euro and European Central Bank (ECB) action. Eurozone growth is estimated at 1.7% next year, up from 1.5% this year. But, the IMF warns that the area is still “vulnerable to shocks”. A shock could force the Eurozone into “prolonged stagnation”, said the IMF. “The region is turning a corner … Our forecast is better than it has been in a long time" said Christine Lagarde, Managing Director of the IMF. Uncertainty in Greece could cause such a shock, and increased volatility from the situation can not be excluded. Greece is in talks with its creditors regarding a third bailout. Lagarde recommended that creditors reduce Greece’s debt. She said Greece needs to reform its economic policy to reflect efficiency. Lagarde seemed optimistic that IMF can reach an agreement with Greece’s notoriously left-wing government, which has repeatedly disagreed with the IMF. “It doesn’t matter what Greece has said in the past. Now more than ever, actions speak more loudly than words,” she said. Lagarde also noted that the drop in worldwide commodity prices will bruise emerging markets. The global economy could face consequences if the Federal Reserve raises short-term interest rates, which have been near zero since the economic meltdown in 2008. Fed Chair Janet Yellen has indicated that a rate increase is likely. However, Lagarde has urged Yellen to delay increases until 2016, citing the sensitivity of the global economy. The Fed and the IMF are "not always exactly on the same page”, but said that they have a strong, productive relationship. The Eurozone still needs time for recovery, reform, and restructure, and not just for the countries in dire straits, like Italy and Spain. The IMF also calls upon countries with excessive current account surpluses - which means international trade and some capital flow. These include Germany and the Netherlands. These countries should focus on infrastructure and boost demand. These intra-zone imbalances hold larger significance; surplus countries can import more from their less economically stable neighbors. What does this mean for real estate in the Eurozone? Firstly, we didn’t need this article to tell us that the real estate markets in the troubled Eurozone countries (Spain, Italy, Portugal, etc.) are near their lowest levels: undoubtedly, more and more foreign investors (U.S./Asia) are looking to this weak areas to visit (an increase in tourism and increased demand for rental property, whether it be hotels or AirBNBs), and to buy vacation homes (Spain, Italy, and Portugal all have miles of coast with splurge-worthy houses). Furthermore, the IMF urges secure countries to invest in infrastructure, which includes both new development and reconfiguration of a range of both public and private structures, including airports, metro stations, and government buildings. Although the Fed has kept the rates the same in today’s announcement (07/29/2015), expect a conference as early as September, where the U.S. could experience a rate hike. An increase in interest rates means lenders would be more restrictive, which means demand for mortgages could see a slight dip. But, an interest rate increase isn’t all bad, as it also increases savings rates, which means all-cash buyers of such properties (which is more common, due to complications of an international mortgage for most normal buyers) will either stay the same or increase. As always, check out the rest of our website to gain an education on real estate investing and crowdfunding. 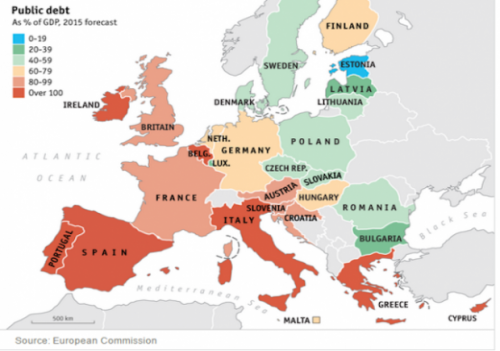 A forecast of public debt in Eurozone countries, expressed as a % of GDP, for 2015. In general, the countries with a higher public debt ratio are often countries in financial trouble. Public debt is one of the most important determinants of economic wellbeing, along with unemployment rate, the income inequality gap, and others.